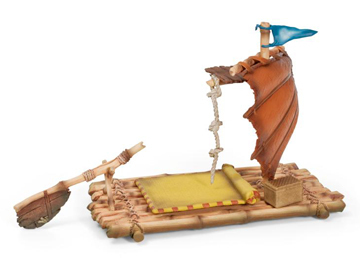 Scheich 42063 - The Arelan Raft with its moving rudder, carpet and treasure chest can transport up to 3 Arelan heroes safely across the waters of Bayala. A wonderful raft with a hide sail and mast rope is the perfect transportation for the Arelan Heroes to move around the Bayala rivers keeping an eye on their kingdom to make sure there is no danger threatening the Elves. This raft can float in real life too.